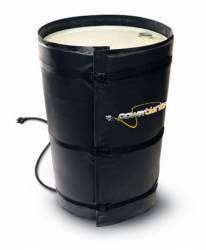 Did you like the blanket heater for 55 gallon drums? Then you might like this one BETTER. It is a blanket heater plus an advantage of having a rapid start, thanks to the Rapid-Ramp technology. It’s called the Rapid Ramp Blanket Heater. How is it different than the normal blanket heater? The big difference is of course due to the Rapid Ramp technology. This lets your drum heat faster since there is a much faster initial heating time. 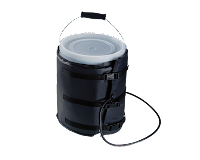 It works with 400 – 800 watts for 55 gallon drum heater, with 800 watts to begin with to allow the drum gets heated in accelerated manner. When it gets 100°F, it automatically switches off the 800 watt power and stays at 400 watt just to keep the content of the drum in that 100°F temperature. This way you’ll save time in the initial heat up time but maintains the temp at lower power consumption to save energy. Is this blanket heater only available for 55 gallon drums? Fortunately not! There are blanket heaters of the same kind for 15 and 30 gallon drums, and even 5 gallon pails! With the same 120 voltage but different wattage – 60/120 W for 5 gallon pail heater, 160/320 W for 15 gallon drum heater and 280/560 W for 30 gallon drum heater, these blanket heaters will make your drums and pails hot in no time. If you are serious about the quality of your products, you want these rapid start blanket heaters! Order now!